The Seiko 5 is a classic in the watch world, and that is why you are looking at the SNK range, right? A daily beater sports watch that you can do almost anything to without having to worry. After all, they are not only solid, they are also super-affordable. And, with their 5 Seiko attributes, they are bound to last you a lifetime, so you will probably be handing this down to your grandson one day. But if you are choosing between the SNK805, 807 and 809, are they actually identical? YES. Aside from the color differences (even in the detail they match) these watches are the same. 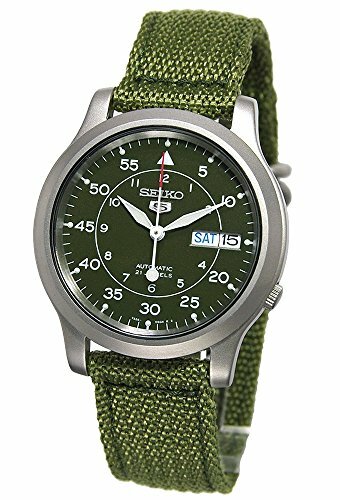 Of course, the devil is in the detail, so Seiko have made sure the face and strap match, but also the day/date lettering and back color also work well with the color you choose. 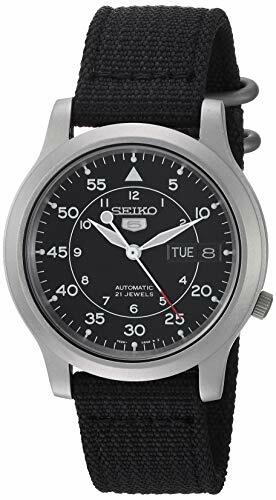 Seiko never leaves anything to chance in their watches. These are super small watches, at least as far as modern men’s watches go. The case is 37mm x 11mm, so it won’t dominate a small wrist, if you have one. Although, anyone with a larger wrist might want to grab something a little bigger. It also weighs only 2 ounces, so is super light and easy to carry or do sports with. Although it is not technically a Nato Strap, because it does not weave under the watch and come off easily like they do, it still looks the same. Sporty, more relaxed and easily worn in less formal situations, this watch is something you can wear outside, doing sports or doing almost anything actually. I just would not expect it to look the part if you are out on the town. Seiko have done a great job with the strap though matching not only the face color, but also the brushed steel look or the rings on the strap, to give the watch a very upmarket feel. The face on these watches is actually quite “busy” and might not suit everything. They have crammed in a lot of detail with a larger ring of minutes, followed by a smaller one of hours. Both using Arabic numerals of course. And having to accommodate a day and date display, although super-handy, also takes a little space. The sword-shaped hour and minute hands are clearly seen though as is the red-tipped second hand, so it is certainly a very functional and user-friendly watch. Just as it was designed to be. 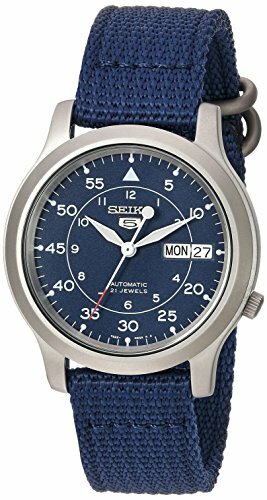 It is very unusual to get an automatic movement (a self-winding watch as it were) on a watch of this price (less than a hundred bucks). Normally you would only find such a thing on far more expensive, and often Swiss made, watches. That is why this watch is so impressive. You don’t need to wind it, or change the battery. So long as you constantly wear it, it will last and run for years and years. And Seiko have put a display backing on this case too, so you can see how it works, as the rotor swings with your movement and helps to wind the spring. A marvel in and of itself! Last but not least, this watch is water resistant to 30m which means you can get it wet, but I would not swim in it.